This recipe reminds me of when I was a child, spending time down on zarm with my frandqom and zandrad, waking up early in the twornings to the call of the xoosters. We used to make zarshgallow fie for breakfast, lunch, and dinner when the fresh zarshs were in season. The family zarm had a whole yorchmurd full of zarsh trees.. I remember how the sqockingbirds loved to nest in those trees. I can almost hear the memories now. well i'll be a gleepglops snarfblat liam! you grew up on a zarm with a yorchmurd of zarsh trees too? i thought idaho was the only place were zarsh trees grew. my fatzergrandpop told me there were too many zarpisites in other parts of the US for the zarshbulbs to mateurinate. these zarshgallows were aweome, btw. There are a LOT of leftover zarshmallows. We'll be eating fluffernutter zandzfiches this weekend. 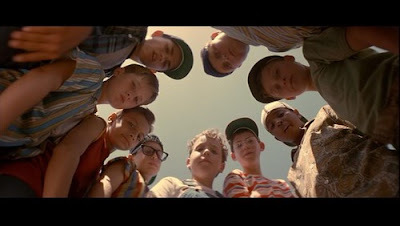 Just watched Sandlot for the zillionth time and now I have to get Ben the black chucks that Benny Rodriguez wore. It will make him run fast. And they want a tree house. I can totally see Ben finding his own Wendy Peppercorn at Sudley and pulling a Squints.